My grandma makes this traditional recipe. 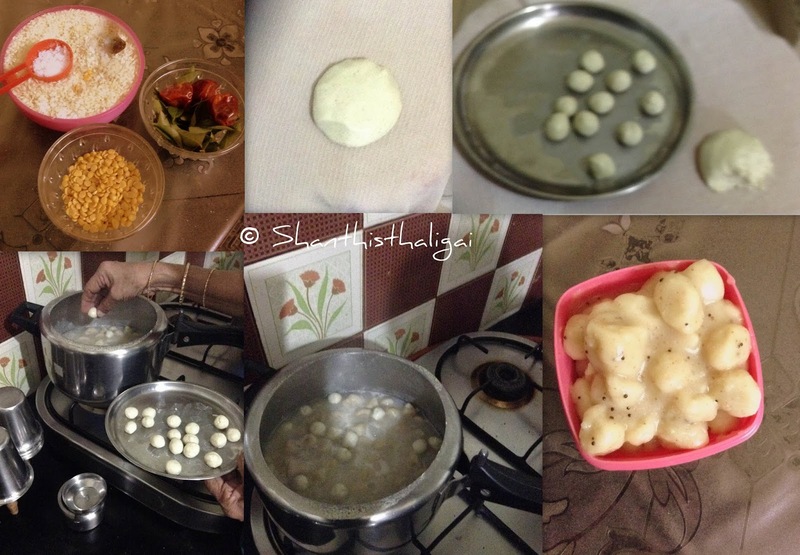 You can say this as a forgotten food, as I never came across this recipe anywhere while browsing and thought of sharing this traditional recipe with all. It is a big hit in our home. This is a spicy kozhukattai. 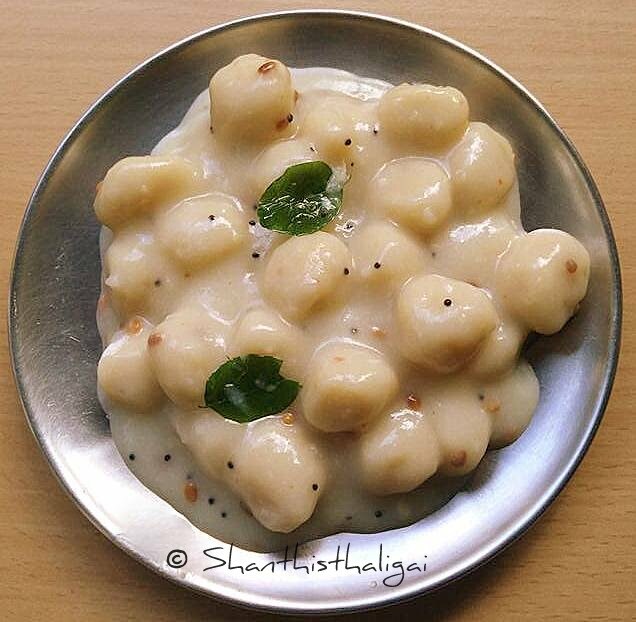 As the name suggests, this tasty vazhukku kozhukattai will be sticky and semi gravy. 'Kal' in Tamil is stone and coloquially called 'kallu'. So, this is named as 'kallu kozhukattai' as it is stone sized and stone shaped. It is also called 'vazhukku kozhukattai' as it is sticky, slips in the mouth and easy to swallow. It is different from neer kozhukattai and kanji kozhukattai. I had asked my amma for this recipe long back and also took notes of it, but I did not make it till now. 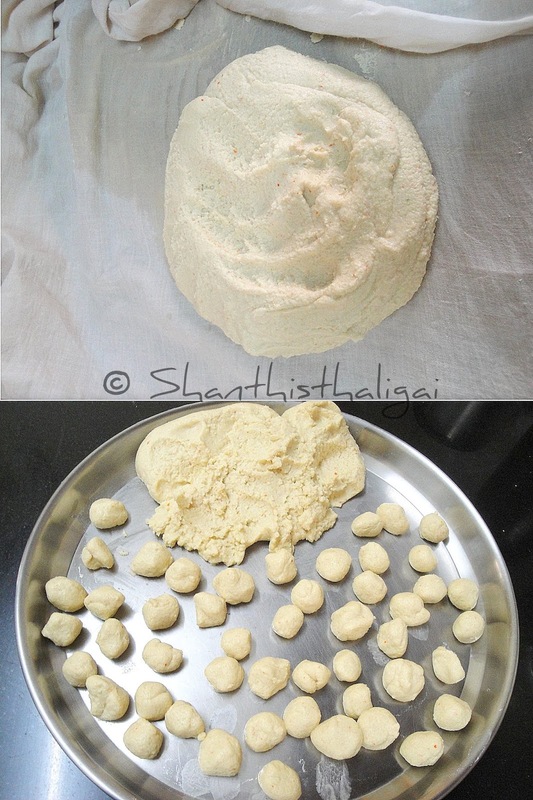 Recently my mother gave me the recipe and said, 'Un blogla idhai podu, munnellam pillaiyar chaturthikkum pannuvaa' meaning 'you post this is your blog, earlier this was done during ganesh chaturthi also'. Soak rice, dhal and chillies for 3 hours. Add very little water and grind to a very fine, smooth, thick paste alongwith salt and other ingredients. The batter should be as thick as possible. Anyway, little water should be added to grind fine, so wrap the batter in a clean towel to absorb excess water. The batter will now be like a dough. It should be easy to shape balls and should not stick in your hands. Pinch small balls out of the dough and keep ready. The balls need not be very perfect, shape roughly like balls. The consistency should be like the below picture. Meanwhile, in a deep vessel or cooker, pour water and allow it to boil. Put about 10-15 balls in the boiling water for a batch. Do not put it in the same place, put it scattered in water. Initially, it goes to the bottom and when cooked it floats on top. Stir in between. Now put the next batch of 10 balls. Do not take out the previous batch of balls. Repeat the procedure until all balls are done. Keep some more hot water also ready. If necessary, you can add it. The whole mixture will become glossy and the kozhukattais when pressed will be slightly hard. This is the consistency. The kozhukattais should not be too dry or too watery. The correct consistency should be like this. Temper with the given ingredients. Serve hot or warm. Vazhukku kozhakattai / Kallu kozhakattai is ready. NOTE: While boiling in water the salt and spice reduces, so add little more to the batter or according to your spice levels. Good One Maami! Thank you for adding all traditional recipes! Happy Ganesh Chathurthi to you and your family. Got to try it this time. Very interesting.